Micro perforation contains 30 perforations per inch. It is normally used for separating items on a sheet. 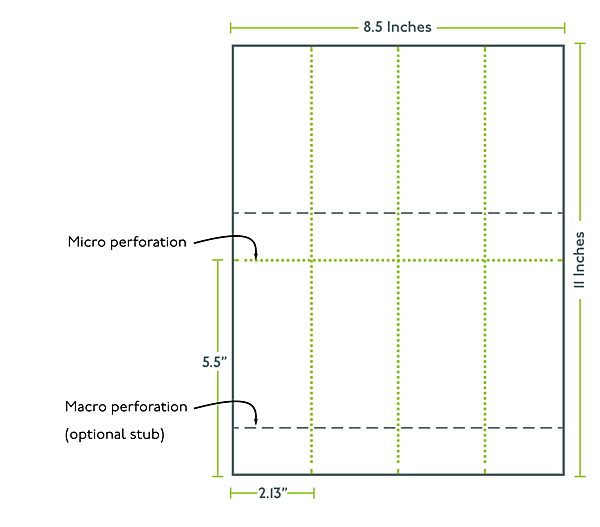 Macro perforation, also called stub perforation, contains 12 perforations per inch. It is sturdier and can withstand more handling than the micro perforation. It is used for detachable stabs on tickets. Here's an example of a 4 columns, 2 rows perforation layout with (optional) horizontal stub perforations across all pieces. With the 8.5" x 11" stock, it gives you 8 easily separable tickets from each sheet, each ticket sized 5.5" x 2.125", with a 1.5" tear-away stub. Or, simply call us at 888.509.1233 and we'll take care of all your perforated paper needs! Perforatedpaper.com offers custom perforated paper and perforated card stock at the lowest mass production prices. Our perforated papers can be used for tickets, certificates, business forms, labels, and printing of all kinds. In addition to perforated paper, we also offer a selection of pre-punched paper of popular specifications. Need to print on your perforated paper? We have you covered! With more than 15 years of experience printing on state of the art digital presses, we can save you time and ensure great quality if you let Perforated Paper handle printing for you. We process orders within 3 business days. Orders placed by phone can be processed within 24 hours, although special rush charges will apply. We can also custom-perforate paper to your exact specifications within three business days. We also offer a wide variety of shipping methods to get your order to you as quickly as you need it.